How Much is Your Corporate Culture Costing You? Does Your Corporate Culture have these “Culture Characteristics”? Mistrust between members of the management team OR between management and the workforce. Silos (departments acting on their own) not working with others to create the best result for the company. “It’s Just the Way It Is Here”… problems with processes and people ignored, especially those “accepted as normal”. No numbers or key measures that quantify and track what is possible to achieve. No awareness of the impact of management beliefs/behaviors on profit, culture and change. Unsustainable change, causing the company to continually shop for one that will stick. If you answered “yes” to these questions, you could be leaving MILLIONS OF DOLLARS on the table! Corporate Culture Losses can exceed $1,000,000 annually! The GOOD NEWS is that there is now a Proven System designed to stop your Culture Losses! The MiningOpportunity System helps you Shift to a Loss Reduction Culture! 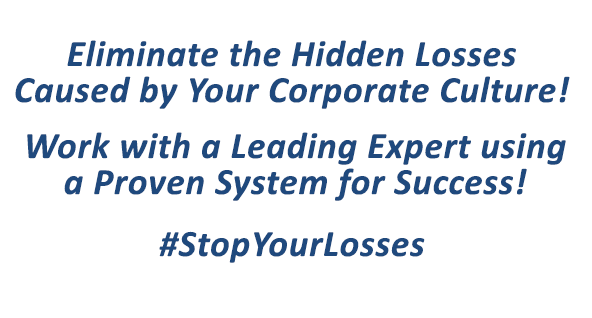 Identify and prioritize hidden losses caused by the corporate culture. Reframe culture losses as culture “opportunities” that create urgency for action and change. Understand management beliefs and behaviors linked to profit, culture and change. Connect culture losses strategically to management decision criteria and working relationships. Employ management strategies and sports-like “plays” that unite the team. Make choices that build trust, collaboration and management credibility with the workforce and the BOD. Sustain the new culture and the profit it delivers for years to come. MiningOpportunity delivers More Money, Happier People and Faster Change! If your Corporate Culture is Weak, YOU ARE LOSING MONEY and DON’T KNOW IT! It’s Time to Talk to THE EXPERT in CULTURE TRANSFORMATION and LOSS REDUCTION! Click Here to Watch our FREE WEBINAR and Receive a FREE 30-Minute Phone Consultation!